And then…three weeks later, no change occurs and the individual gives up on the goal having only gained a sense of guilt and failure. This scenario, I think we can all agree is unfortunately far too common. 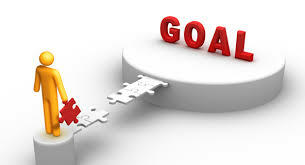 There are actually three different types of goals: Outcome, Performance and Progress. 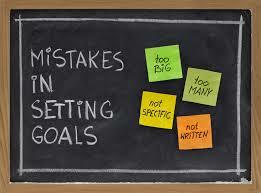 The problem lies in that most people only set the OUTCOME goal. At some point in the future, you would like to lose 10 lbs. An outcome goal is the end result of what you are trying to achieve. It’s problematic because if it’s vague and too far out in the future, then there’s no sense of urgency. The PROCESS goals relate to the specific steps you must take to achieve better performance. school. Having been an athlete, she decided that three years after her son was born it was really time to get rid of “the baby weight,” especially since that baby was rapidly growing out of the toddler stage. Her OUTCOME goal was to lose 10 lbs in five months. This is a doable goal: Having estimated that the average woman at optimal weight loss loses a 1/2 lb/week. That would take her 20 weeks to lose 10 lbs. Notice, she got specific – she did the math and put a date down on the calendar. Also, she realistically gave herself an appropriate amount of time to achieve her goal. With this roadmap guiding her through the next few months, she’s not likely to feel completely disappointed two weeks later. To define a PERFORMANCE goal she needed to address what she had to do to get the weight off. She identified three areas that needed more specific attention: 1) Nutrition, 2) Cardiovascular work and 3) Strength training. Therefore, she set PERFORMANCE GOALS, ways to measure her success for each category. For example: Regarding nutrition, she ate a balanced breakfast five out of seven days; regarding cardiovascular work she committed to running four days a week for twenty minutes; and regarding strength training she committed to going to a body sculpt class twice a week. Lastly, she really took the time and thought about her PROCESS goals. “What specifically do I have to do to get my self to perform better?” She thought about her time management and realized that she did set aside the time to go to the gym, but when she got to the locker room to change she would start chatting with friends and whittle away the time dedicated to her PERFORMANCE goals. So she began coming to the gym ready to go straight to the workout. And she steered clear of chatting with everyone. I’m going to put this into outline form because writing down your goals and strategies will ABSOLUTELY aid you in achieving the best things in your future! 1/2 lb/week on ave. for 20 weeks = 5 months. June 1st, 2014 is my optimal date and it’s written on my calendar!!! Run four x week for 20 minutes – Mon @ 7am, Tues @ 7am, Thur @ 7am, Fri @ 7am. It’s written in the calendar for the next five months. Do two body sculpt classes/week – Mon & Fri @ 7:30 am. PROCESS GOALS: What will help me achieve my performance goals? 1) Nutrition – Meet with a nutritionist once a month to learn what is a balanced meal and what is an appropriate portion for me. Come dressed, ready to do my run. Don’t chat – just get on the treadmill. Meet with a trainer at week 4 to determine my anaerobic threshold (heart rate range) and build a cardio program around it. Meet with a trainer at week 6 to assess my strength and learn how to safely increase the weights I’m doing to keep seeing changes. Form a support group with my best friend to help me stay on track. 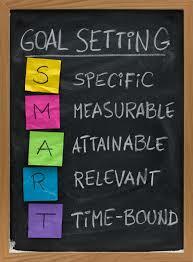 Goal Setting should be specific, positive and shared with anyone who will help uplift you and be on your team. When done this way it is a valuable tool to help you realize your highest concept of self!